Before Steven Tyler fell short of offering any sage advice as a judge on “American Idol” (too bad), he spent decades stealing the spotlight as the inimitable singer and showman of Aerosmith — a band that is easily among my Top 3 all-time favorites. Tyler also ranks as my all-time favorite singer. Amazing voice. Electric energy. Stylistic swagger. Lord of the Thighs. When Aerosmith rolled through Houston on the “Get a Grip” tour in 1995, I was sent to review the concert for the Galveston Daily News. While arranging press credentials with the band’s publicist, I was offered a photo pass and quickly jumped all over it knowing it would allow me access to the edge of the stage for some up-close razzle dazzle. Never mind that I was barely capable of aiming a disposable point-and-shoot. Oblivious to the finer points of photography, I asked GDN staff photographer Kevin Bartram if he would risk loaning me one of his Cadillac cameras and please kindly set it to Idiot Mode. As you can see from this photo, Kevin’s neutral settings combined with my frantic snapping (and a lot of dumb luck) resulted in a fairly decent shot of Mr. Monkey Mouth. And no, that is not my hand high-fiving Tyler. After all, I am a professional who wouldn’t dream of stooping to such a lack of control while on official assignment (yeah, right!). Nonetheless, my over-eager counterpart got my idol to walk our way, which allowed me to pop this photo. I have loved Steven Tyler since I was a teenager! It is no wonder that our wedding song was “Don’t wanna miss a thing”. Steven Tyler sings from his soul and he is a true artist of music. His heart is as big as the awesome songs he belts out of his mouth. American Idol will be more popular than ever before. He definately has something unique and profound to offer to the show. Yep. He’s the best. Even when he talks you can hear “that voice.” Thanks for reading and posting, Chris! he’s a very intelligent guy and one of the “stars” i’d love to sit down and chat with a bit. Thanks Dave. 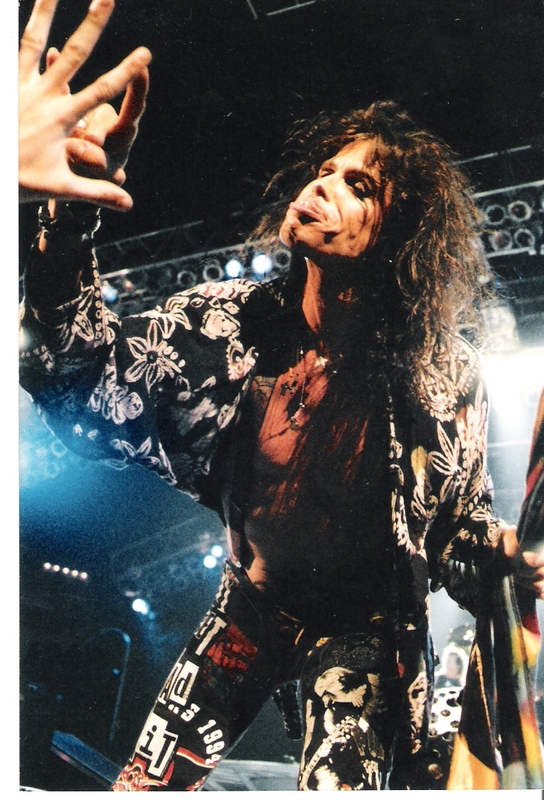 I love Steve Tyler and Aerosmith, since I was a kid. They created a distinctive sound and wrote great songs that stood the test of time, and never seemed to get caught up in the media trash machine. Good call! Thanks for reading and posting, Bek. Steven and Aerosmith rank at the top of my list.